The first session of Nana's Cooking Camp took place this past week. Five of my seven grands took part. We made homemade vanilla ice cream in my Donvier ice cream maker. 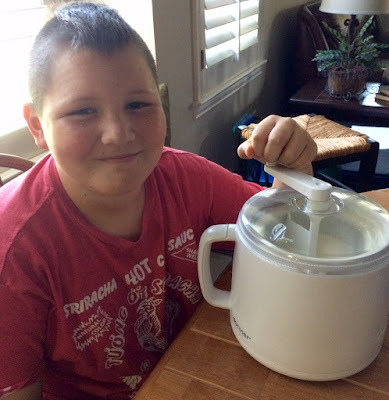 All the kids had a turn at mixing up the ingredients and then turning the crank. They loved it! We also made Nutter Butter Ice Cream Cookies to go with our ice cream. I think they were a hit, too! To make the "ice cream cones", you dip the tops of Nutter Butter cookies into melted white or milk chocolate almond bark, lay onto wax paper, sprinkle with colorful sprinkles and top with a "cherry" M&M. I had my own tea party the next day with some leftover cookies. These cookies are so tasty! I hope you try them with some special little people in your life. 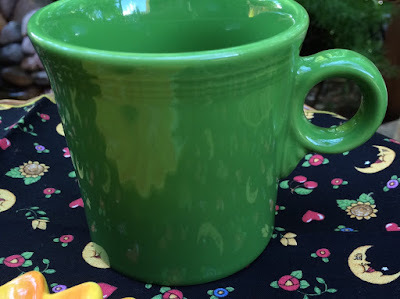 I'm using my shamrock green Fiesta Ware mug that coordinates with my sunflower plate. My napkins also have sunflowers sprinkled in. Mr. Frog was given to me by my daughter and I planted him with my St. Patrick's Day shamrock (Oxalis) plant. Oh Kitty I love the idea of Cooking Camp with Nana! 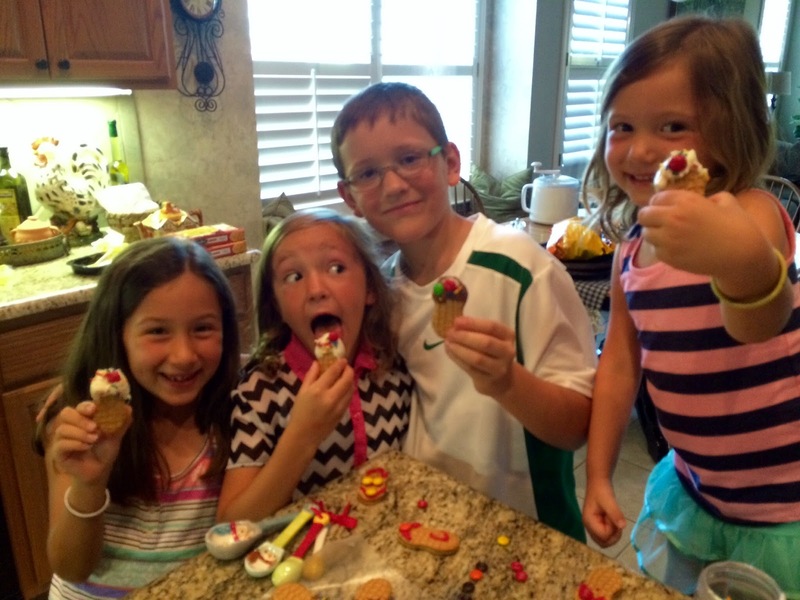 Homemade ice cream and cookies are the best and sounds like so much fun! Thanks for sharing at our Cooking & Crafting with J & J Link Up Party! Their Nutter Butter treats are too cute! My son and I will have to make some of these one afternoon. Happy Monday, sweet friend. Love ya! Oh my goodness...that looks like you had so much fun! Love your pig sign valet and the nutter butters. Perfect time with the grands. Thanks for linking to Tuesday Cuppa Tea! Looks like the kids had fun at Nana's Cooking Camp! Who knew so many things could be made with Nutter Butters! Those are the cutest little sundaes. Your grandchildren had a ball, one can tell! You are such a wonderful Nana! Love the green colour of your mug and the frog holding the shamrock plant is so cute! Thank you for sharing and joining me for tea. Have a wonderful week, my friend. Cooking camp looked like a real success! What a great nana you are! I love nutter butters; such a fun way to decorate them, too. Very cute grandchildren. The grands look very happy to be joining you for the fun! Homemade ice cream...yummo! The cookies look like a special treat. Sweet campers! I have some grands who would have loved to have been at that camp! Kitty, what a great time the kids must have had! You are such a wonderful Nana and I'm sure that ice cream was delicious! I like having Nana camp and the kids love it too! You are the coolest Nana ever! What a fun way to educate your grandkids in the culinary arts! What a fun thing to with the grands Kitty, I'm sure they enjoyed every minute of their time with you! The cookies are cute and I'm glad there were some left for your afternoon tea by the pond with the froggie vase. Wow! No time for boring stuff at your house! Great fun and education! I loved this post with those cuties! Nana's cooking camp is definitely a winner. You can tell by the open mouthed smiles. Such cuties! You are creating such amazing memories for and with your grandchildren while teaching them some valuable skills. The "ice cream" cone cookies are quite clever. Love your Fiesta ware mug. The green is so vibrant. So adorable, it looks like you had a fabulous time! I love the "ice cream cone" idea, so adorable, pinning that one! The fiesta mug is perfect for Summer, as is your sunflower plate! Such a fun and tasty time with the 'grands'! Then any time with grandchildren is great! I'll have to try the ice cream cone cookies with my 'grands' . What a cute idea (and so easy!) to do with your grands! I love this idea so much I may have to try it with mine! I have those plants for the first time on our porch. I have the darker ones. So different and pretty. I love this post, Kitty!! Look at you with all your grandkids working beautifully together in their first cooking class together. Love it! He would get a kick out of them in his lunch. It's good to visit with you as always, my friend. I want to come to Nana's cooking camp!!!! Such a great idea--cooking camp! The cookies are cute as can be. One of the tea party books has a recipe for sprinkle-chocolate dipped goodies. I just need my little grand to help. :-) Have a wonderful week! ah....I know how fun this was...the best part of my year is when all 7 grandgirls come over to make Christmas Cookies...I will add these adorable peanut butter ones to our cooking decorating. Your grands are all so adorable and look like they had a marvelous time with their Nana. Hi Kitty, What fun! Such cute grandchildren and I can tell they were having a great time. The cookies are adorable, and who doesn't love homemade ice cream? I haven't made any yet this summer and thanks for reminding me to do so. I really like malted milk ball ice cream - it uses malt powder and crushed malted milk balls. Mmmmmm! Summer time is the best when with Grandma! Kitty I love how you spend time with your grand kids. They truly look like they are having a lot of fun. What a special time together. The cookies do look good. Love your tea setting! Hi Kitty, you are such a good grandmother! What a special time and lots of memories for them and you! Such cute idea with the cookies and your tea time so darling. Thank you for the sweet comment you left me. I have been very busy with my grandsons, too! You, my dear kitty get Nana of the Year award. I never had a grandmother alive so I love to learn how others' do it. I daresay you nailed the fun factor. Well done, ma'am! Kitty, this post made me smile. It brought back many happy memories of cooking with my grandmothers. You are making memories your grands will never forget! Kitty, I LOVE the name of this post, and the sign is sooo cute!! :) I bet your grands had a ball at Nana's cooking camp; I know I would. :-D Homemade ice cream is a favorite in our family, and those cookies are so cute. I love your frog planter with the shamrock (one of my very favorite plants) and your colorful tablecloth is so pretty! I hope you have a great weekend, my friend. Are you kidding?! What kid wouldn't sign up for that camp!! Those nutter butter cones are so cute,! And Shamrock is my absolute favorite Fiesta ware color. Love it. Kitty, how delightful! Is it too late to sign up for Nana's Cooking Camp? What a lucky group of kiddos to get to go to Nana's Cooking Camp. From those happy smiles, it looks like all had a terrific time. Their ice cream and cookies would make me smile too. Look like a lovely tea was had by all. The nutter butter ice cream cone cookies are a great idea. Lovely oxalis. I like old fashioned plants. How fun Kittty. You are an amazing grandma! Making wonderful memories. Thanks for sharing with SYC. Hi Kitty! Sorry I missed this tea last week...and Nana's cooking camp sounds so fun! Nutter butter and ice cream sounds good to me! I also took my shamrock plant from St. Patrick's Day and planted it outside...although your frog pot is perfect! Oh my goodness, what a fantastic time you must have had. I just love your Nana's Cooking Camp, it is awesome! Thanks so much for sharing your post with Full Plate Thursday and have a great day! Wow, how do you handle seven! Cooking camp sounds like so much fun Nana! We have 4 grands and it's like herding cats right now, but maybe when they get a little older...we just bought a play grill for them to "cook" on outside, so that's about all I can handle right now! Wow, your shamrock plant is doing great. Mine barely makes it to March 17th. lol. Fun day with the grands.